After rising to become one of the easiest and most popular payment methods among Korean users through its flagship messenger service, Kakao Pay announced Monday it is expanding its business with an easy-to-use investment facilitator platform. The mobile finance unit of South Korean mobile messaging giant Kakao announced the launch of a new service, Kakao Investment, which lets users invest in various projects through the KakaoTalk messenger without the need to install a separate app. The service will become available from Tuesday. 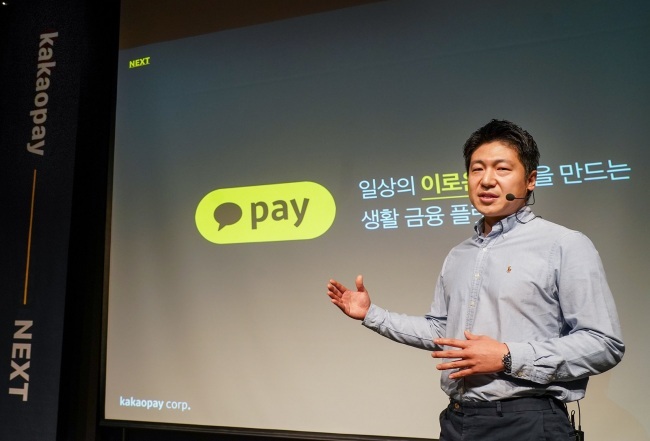 “If Kakao Pay focused on how to make spending easier for users until now, we are now looking to help users earn profit (through investments) in the most convenient way,” Kakao Pay CEO Ryu Young-joon said during a press conference in Seoul. The biggest advantage of Kakao Investment is convenience, as users do not have to install a new app or sign up and link new bank accounts. The low minimum investment requirement also opens up investment opportunities to a wider public, Ryu said. Users can open the KakaoTalk app, access Kakao Pay and click on the “investment” option to browse through a list of potential financial products to invest in, ranging from crowdfunding projects, securities and funds. The expected amount of return, excluding tax, is shown on a simple interface. Kakao Pay said it has selectively picked out “mid-risk, mid-return” financial products expected to guarantee a return of around 10 percent. The minimum amount required for an investment is 10,000 won ($9). While noting that all investment carries some level of risk and uncertainty, Kakao said the investment options it has prepared have been carefully selected and packaged to ensure a profit of at least 6 percent and as high as 15 percent. In addition to the investment service, Kakao also plans to launch a cross-border mobile payment service by the first quarter of next year in partnership with China’s Alipay, operated by Alibaba’s financial arm Ant Financial Services. Ant Financial is currently Kakao Pay’s second-largest shareholder, having invested $200 million in the Kakao subsidiary in February this year. Since the partnership began, Kakao has been working to make Kakao Pay’s QR code and barcode payment service compatible with Alipay, and therefore available at Alipay-supported stores and businesses abroad. The firm will first roll out a cross-border payment service in Japan -- where mobile pay services are being strengthened ahead of the 2020 Tokyo Olympics -- and later move into China and Southeast Asia. Steps to make Alipay available at Kakao Pay-supported stores in Korea are also underway, to raise convenience for foreign tourists, the company said. “Kakao Pay users will no longer have to exchange currencies when visiting countries abroad, while foreigners visiting Korea will be able to pay for their goods more conveniently,” Ryu said. According to the Kakao Pay CEO, the launch of its two new services are part of its broader vision to emerge as a “techfin” company, in which information technology leads innovations in finance, rather than the other way around. “If Kakao Pay helped build a ‘wallet-less' finance paradigm until now, we now want to focus on making finance more ‘effortless’ for local users,” he said. It has since introduced a slew of new areas such as biometrics authentication, membership barcode accumulation, and utility bill payment services. This year, it entered the offline payment realm by introducing a QR code and bar code payment option. As of end-October, Kakao Pay’s monthly transactions handled surpassed 2.3 trillion won. The firm’s fleet of mobile finance services currently has around 25 million registered users, including 13 million active users per month.